"Hi there, Neighbor," as was the frequent greeting from beloved children's show host Fred Rogers on his long running PBS show Mister Roger's Neighborhood. Rogers who was born on March 20, 1928, wanted television to be used as a medium to teach, nurture and entertain the children in the community. His show helped many grapple with difficult subjects and become positive, productive members of the society. He even advocated and testified to the U.S Senate Committee for an increase in government funding for public broadcasting and won in 1969. This was also in the beginning years of his show. The show ran from 1968-2001 and taught children the value of making friends and self esteem building. 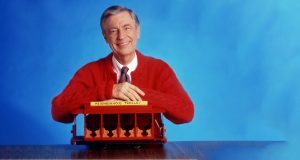 His show would feature regular visits by trolley to the Neighborhood of Make-Believe which included King Friday XIII, Queen Sarah Saturday (named for his wife), Prince Tuesday, Henrietta Pussycat and many more characters taught lessons and shared stories for the children who tuned in everyday. Rogers wrote 289 songs and more than 36 books throughout his career and the broadcast of his show. When I was a child, my family and I had fun guessing which color sweater he would wear for the day's broadcast. The things he taught each and every child, and even adults, who watched the program stay with us to this day. All of our neighborhoods were improved, if only for 30 minutes, from the existence of Mister Rogers and his friendly, calming demeanor. He taught us we were all special in our own way and to look for the helpers of our society when bad things are happening. "You've made this day a special day, by just your being you. There's no person in the whole world like you; and I like you just the way you are," said Mr. Rogers at the end of every broadcast. Here are a few things you can check out from the St. Tammany Parish Library that Mister Rogers left behind for us, his neighbors.